During the 1980s, the Hainburger Au was successfully defended against a proposed hydropower plant. This marked a turning point in Austrian democracy and environmental politics. 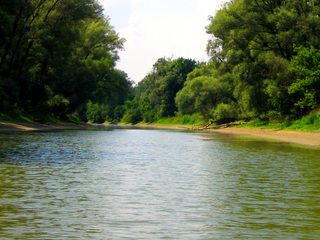 The Hainburger Au is a unique riparian ecosystem located along the Danube river, next to the town Hainburg, Lower Austria. More than three decades ago, the area was successfully defended against a proposed hydropower plant, which marked a turning point in Austrian democracy and environmental politics. It was on April 28, 1983 when the Austrian company Donaukraft AG first announced their plans to construct a hydro-power plant in the area. Soon after, support was announced by the government, comprised at that time of a coalition between the social-democrats SPÖ and the right-wing liberal party FPÖ. However, concerns emerged immediately over the ecological impacts. The hydro-power plant would destroy large riparian ecosystems located next to the Danube river that depended on natural flooding periods. While those in favor justified the plant for reasons of employment creation, and for being an important alternative to fossil and nuclear energy, those against argued instead for reductions in energy use. In their opinion, big hydropower was no acceptable alternative. Nevertheless, on December 22, 1983, former minister of agriculture Günter Haiden formally pronounced the project as a priority project with significant importance for the Austrian economy. 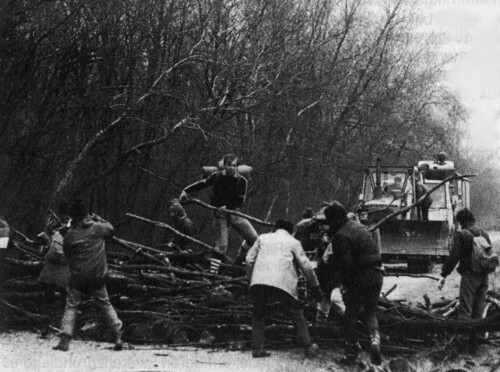 Preparation and forest clearance work started in 1984 in the village Stopfenreuth [1;2]. Mobilizations against the project started not only due to environmental concerns, but were also a reaction to how governmental decisions were made in a top-down manner . The grassroots activist group ‘Aktionsgemeinschaft gegen das Kraftwerk Hainburg’ (Taskforce against the Hainburg hydropower plant) was formed and soon supported by several big civil society initiatives and organizations, such as Greenpeace, Global 2000, WWF, and the Austrian National Student Union . In late 1983, WWF Austria launched a campaign to save the Hainburger Au (Rettet die Hainburger Au) and the civil society groups began to identify arguments for why the project was unconstitutional . 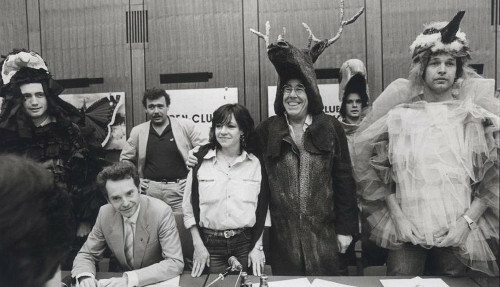 On May 7, 1984, a so-called ’Press conference of the animals’ was held, in which prominent politicians and artists dressed up as animals to debate the hydro-power plant construction, to discuss its potential impacts, and to publicize and support the petition for a public vote on the project. Thanks to this creative action, the event enjoyed massive media coverage and the future of the Hainburger Au became a key issue in the wider public [1;2;3;4]. The petition for a referendum found prominent support such as from Nobel prize winner Konrad Lorenz and would later reach more than 350,000 signatures. However, despite the apparent concerns voiced by civil society, the project moved forward . 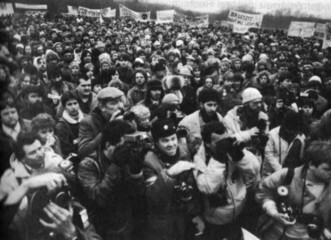 On December 8, 1984, several groups, including the Austrian National Union of Students, organized a large gathering in which protesters converged from different directions at the Hainburger Au . It was reported that 10,000 persons joined the march . Several hundred persons stayed in the area and occupied the forest, with the aim to end the clearance of the riparian forests . Many more people joined the occupation of the Hainburger Au over the coming days . Resistance was non-violent, though illegal, as the area had been declared a prohibited zone . The protesters received wide support in Austria as well as through affiliated groups elsewhere, such as through the German activist group ‘Robin Wood’. For example, some of the latter crashed into the famous German TV show ‘Wetten Dass’, where Austrian Chancellor Fred Sinowatz was an invited guest, to denounce the hydropower plant . The conflict escalated on December 19, 1984, when about 2,000 police forces clashed violently against 4,000 protesters. 26 persons were injured . The same day, a mass demonstration was held in Vienna to denounce the repression of the activists, in which more than 40,000 people assisted . Mainstream newspapers such as the ‘Kronen Zeitung’ started to be critical with the project . Two days after the violent clashes between activists and police, former Chancellor Fred Sinowatz declared a ‘Christmas truce’ and suspended the project temporarily until January 1985. Finally, on January 2, 1985, the higher administrative court judged in favor of a complaint lodged by WWF that argued that the project was unconstitutional . On July 1, 1986 the administrative court further revoked the original ruling that endorsed the project . About ten years later, the Hainburger Au became part of the Donau-Auen National Park . Today, it has turned into a symbol of successful resistance of civil society against unsustainable resource uses , as well as an important milestone in Austrian democracy. It marked not only a new era in grassroots politics and civil society participation in decision-making, but also the formation of the political party ‘Die Grünen’ (green party) [1,3,4]. The conflict thus contributed significantly to shaping new democratic pathways in Austria. Project Details Planned investment size was about 930 million Euro . The company stated that about 680 ha of riparian forests would be affected . Development of Alternatives Ten years later, the area became part of the 'Donau-Auen National Park'. Why? Explain briefly. The project was stopped. Gutschik, Reinhold ; Horvath, Patrick ; Weinzierl, Rupert: Konflikte um Infrastrukturprojekte in Österreich : Erkenntnisse für Politik und Gesellschaft. In: SWS-Rundschau 47 (2007), 2, pp. 218-242. ORF online news article (8.12.2014; Gerald Heidegger): „Das wärmende Gefühl des Zusammenstehens“. (accessed online 11.12.2017).